I don't usually listen to a lot of instrumental music. I suppose I put a lot of emphasis on the singer's voice and the lyrics, too. However, every now and then you just stumble upon music that's too good to pass, no matter whether it represents your usual music taste or not. Remember when I told you guys about the list that I keep of bands and artists that I should check out? 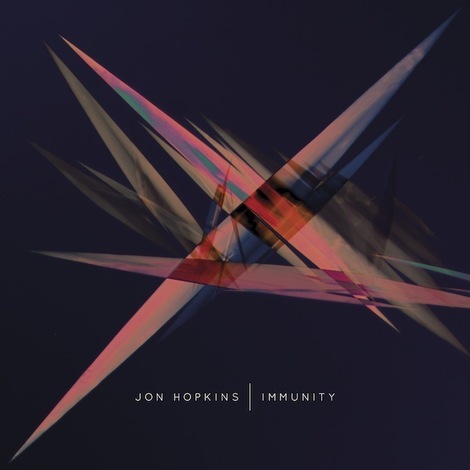 The British electronic wizard Jon Hopkins used to be one of the names on that list and, well, I'm extremely pleased that I gave his latest record a spin. The album, titled Immunity and released last year, was actually met with wide critical acclaim and was even nominated for the Mercury Prize for best album. It did ultimately lose to another electronic album though, namely James Blake's Overgrown. So the record is mainly instrumental, with only occasional appearances of human vocals. Sampling dreamy electronic instruments and sounds taken from everyday life actions, Hopkins uses his synths like an artist would use paintbrushes to paint an enchanting urban panorama that's simultaneously vivid and soothing. The individual songs can be somewhat lengthy - the longest track on the album, "Sun Harmonics", clocks at nearly 12 minutes - but while the beats and the synth riffs are repetitive, they're still not boring. Instead, Hopkins succeeds in crafting atmospheric pieces that profit from the power of repetition. To give an example of the everyday samples he uses, the album kicks off with city noises he recorded while standing outside; some cars can be heard in the distance. Then you hear the jingling of keys that open a creaking door. He steps into his studio and this breaking of the fourth wall leads into the brilliant opening track "We Disappear" (the current Song of the Week, by the way), a melancholic number driven by propulsive beats and sparse touches of piano. The last minute and a half is especially spectacular: after the synths and the beats fall silent, what remains is a hypnotic hook that envelopes the listener in a magical ambience, almost as if you were floating in space, in the infinite emptiness save for the ever so distant stars that twinkle faintly like the closing notes of the song. The outro then segues into the second song, "Open Eye Signal", an almost eight-minute track that balances between ambient and dynamic, while also creating an unsettling sensation not unlike that feeling you get in the middle of the night when you can't sleep and for some reason just need to get out. There's underlying hints of claustrophobia that play beautifully within the song. Despite its length, it was released as the lead single from the album. As you can probably guess by now, Immunity is a highly visual album in the sense that it paints lots of images and emotions through its music. That's the thing I most adore about instrumental music - when there's no lyrics or vocals to guide you, it leaves much more space for personal interpretation and self-reflection. And if there's one thing that Hopkins certainly excels at, it's creating fascinating sonic vignettes that beckon the listener to step in. The exquisite "Breathe This Air" and its sublime synths for example take you for an engaging journey, while the majestic synths of the ethereal "Abandon Window" crash in like rolling waves in slow motion. The aforementioned "Sun Harmonics" represents the more uptempo side of Immunity, being a pulsating stomper of a track, although while this is an electronic album it still shouldn't be taken for a dance-y album of any kind: most songs - while driven by vibrant beats - are still more on the dreamy side, like urban meditation music if anything. The closest you come to a 'dance floor banger' would be the massive "Collider", and even that I can only see being played in some kind of a hidden drug-fuelled underground club in an episode of Skins. The song, however, is epic. Another stand-out moment worth mentioning is the incredible title track "Immunity", a 10-minute slice of serenity that Sigur Rós would kill for. There's some unintelligible vocals sung softly that complete the experience. Closing the album on a magnificent note, I couldn't imagine a better final song for Immunity. Phew. It's easy to get loose with the superlatives but the music's really just that good. All tracks might not soar to equal heights but the ones that do are glorious. It's no wonder the album was included on several 'Best of 2013' listings - had I discovered it earlier, it definitely would've appeared on mine. Hopkins depicts dreamy nocturnal sceneries with his experimental glitchy sound so effortlessly that you would do wisely to check the album out.